Glenavon have signed 26-year-old striker Darren Forsyth on a short-term deal until January. Forsyth has had spells in the League of Ireland with Shelbourne and Bray Wanderers and has scored five goals in two games for amateur league side Greystones FC this season. Glenavon needed a replacement for Guy Bates who has gone to Australia. Manager Gary Hamilton described the signing as "a calculated risk" as he has not seen Forsyth in action. 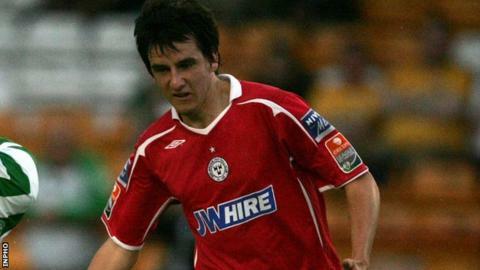 Hamilton has signed the Dun Laoghaire resident on the advice of former Glenavon player Tony Grant. "When Tony Grant tells me something, I listen, as Tony wouldn't want to let Glenavon down and he always wants the best for this club," Hamilton told the club website. "Darren has signed on a pro contract until January which gives us a chance to look at each other and, if it works out for both of us, we can sit down again in October or November and reassess. "I want to thank the officials at Greystones FC for allowing Darren to move on and give semi-professional football in Northern Ireland a go. "It's a chance for him to play at a higher level and it's a chance for him to show us what he can do. "He's at a good age when he's mature and they say players are at their peak between 26 and 29 so hopefully he can show us that he should be playing at a higher standard." Glenavon host Ballinamallard United in the Irish Premiership on Tuesday night.